Not so ironically, they quickly demonstrated their uncreative self in the interview process. More precisely, it was her questions that gave it away. At the end of our meeting, when she asked me if I had any questions, I asked if she was ever going to ask any creative questions. Hmm. Let’s summarise. She’d buy legal, mind-altering drugs and have a Taster’s Choice moment. I have nothing against coffee. Just ask Starbucks, or my corporate MasterCard. But caffeine won’t make you more creative, just more jittery. Herein lies the problem for organisations trying to instill a stronger internal creative culture. Judging by American television, you’d be forgiven for thinking Americans love pharmaceuticals. But, being more creative isn’t about swallowing something. The spark is not external. Of course there is a part of creativity that requires external focus: deep-diving into the facts, articulating the problem, discovering attributes and elements of the situation, talking and learning from the audience, discovery and exploration of the world in general. But even these tasks are taking external information and making it internal. At the end of the day, creativity is something that comes from inside. Creativity is passion. 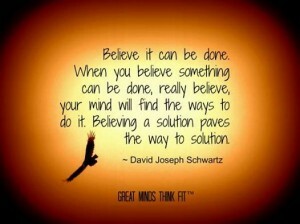 You must believe you can find the solution. Hugh MacLeod calls it a ‘drive.” Donald MacKinnon calls it “behavior, not talent.” Call it a hunger, a desire, or a passion. It’s an internal struggle not just to make something, but to make something else. To paraphrase a Chinese proverb, if the external part of creativity is creative food for the brain, perhaps the internal focus is food for the heart. By coincidence, I received this e-card a few days ago, and it sums it up nicely. How do you find ways to stir the passion of your creativity? Previous story Is Linear Thinking Bad?